Hi! My name is Emily Hansen and I am currently a sophomore at Loyola University Chicago majoring in Social Work. My hometown is a little bitty suburb called Volo up north in Illinois. I am very excited for my adventures in the Loyola Vietnam Center for the Spring of 2018 and the rich culture and experiences that tie into my major are just a few of my motivations that led to me to choose Vietnam as my study abroad semester. Follow me along as I am dive right into this experience! Have I ever mentioned how much I love Vietnam? 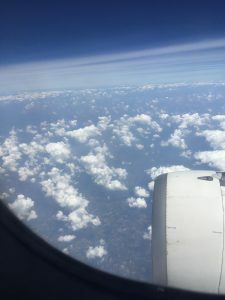 Some people and loved ones that read my blog posts probably think I’ve spent much of my semester miserable because I almost always find a way to squeeze into my blogs about being homesick. Yes, I’m homesick, but I also really don’t want to leave. I want to bring all my loved ones to Vietnam, so I can stay here without missing my people back home. This past week we went on our last excursion of the semester to the Northern and Central regions of Vietnam. The regions of Vietnam all have distinct characteristics about them which I heavily learned on this trip, but I will get into that in little bit. Our first stop was the Central region. We spent just about 24 hours in a central city called Hue exploring some of the more historical parts of our trip. Some highlights were the Imperial Palace, Thien Mu Pagoda, and the Tomb of Emperor Minh Mang. It was a day heavy with information, but information I had no idea about from out ~Eurocentric education~. Afterwards we took a bus ride to a city called Hội An. I’m not going to lie, this was my favorite city on our excursion. Before we got there, we passed through the Hai Van Pass stopping at a colonial military post. It was cooler in temperature and looked like what I thought would be “tropical Colorado”. Hội An itself was definitely a tourist area, but not in a negative light. It kind of felt great to be a tourist. We walked along the river and visited the markets and bargain for souvenirs (no spoilers for my friends and family) and relaxed. Something called Earth Hour was occurring one night we were there where the entire city turned out the lights for, you guessed it, a whole hour. I was in the streets at that time and walked around and it felt like I was in another dimension. 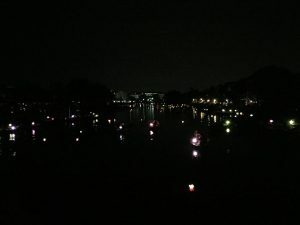 People were selling glow sticks, eating dinner lit by candle lights, and lighting candle lanterns to float on the river. The real question is why doesn’t America institute this??? 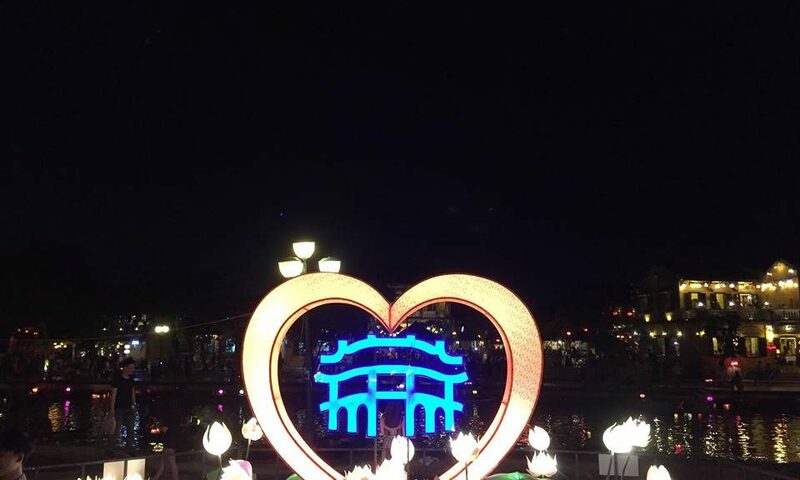 I hope to return to Vietnam one day with my loved ones and Hội An is definitely a stop I want to take again. Our last stop was Hanoi, the capital of Vietnam. I know majority of the people reading this don’t know what Saigon looks like, but Hanoi is Saigon with less sidewalk, more condensed streets, and more foreigners. 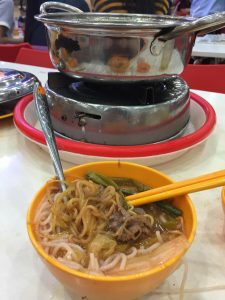 In Saigon I feel like we are the only foreigners living in district ten which is great for immersing us into the culture and not just living along side other travelers in districts like one and two. We stayed in the Old Quarter where a lot of tourists congregate so it was bizarre to hear English all around us and to have conversations with Australian and British people in English rather than my sad attempts at Vietnamese with local people. 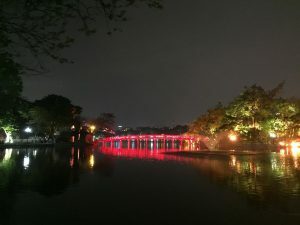 We had a lot of free time in Hanoi, but we visited a few historical sites as well. First, we waited in a really, really, reallllly long line to see the mausoleum of Ho Chi Minh. Colloquially known as Uncle Ho, he is the single most important historical figure in Vietnam. His body is preserved and kept in a mausoleum that is open to the public, so we waited in the longest line I’ve ever seen (and I’ve been to Space Mountain at Disney, so this was the real deal). It was very interesting as we waited for a very long time to walk through the actual mausoleum in about 30 seconds. It was interesting to see just how devoted Vietnamese people are to Uncle Ho and to get to be a part of that experience. We also got to see a water puppet show which is something very common usually in northern Vietnam. They have roots going back many decades and it was amazing to look at although I had no idea what was going on (curse the language barrier). We finally hit Ha Long Bay as our last trip before the airport. 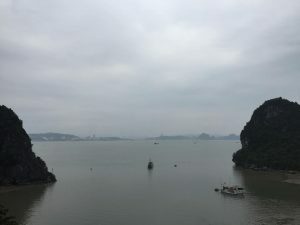 We took a boat out to the bay and got to kayak and visit a cave before we came back to Saigon. Coming back to the differences in the regions in Vietnam, there are quite a few. Norther accents are wild. 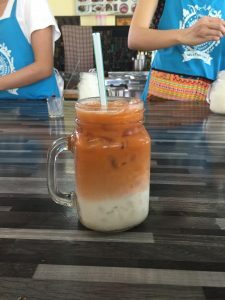 The tones of the Vietnamese language are completely different, and I had quite the adventure ordering coffee and learned there is a completely different word for coffee with ice and milk instead of what I know and have memorized from the south. The food is also spicier. No lemon, which is by the way a small green lemon that looks like a lime but is a lemon, with my pho so I had some trouble in that area too (I cried while eating super spicy curry in Thailand). It was also quite cooler and dare I say I was chilly in 70 Fahrenheit degree weather. I am now back in Saigon preparing for the amount of school work that is about to slam into me and locking myself away in coffee shops to work. 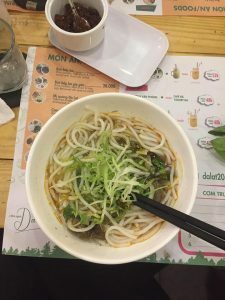 I went out to dinner with my roommate and a few Vietnamese friends as the rest of our group is still up North as we did not optionally extend our trip for an individual trip and came back to Saigon. It is going to be hard to say goodbye as we have less than a month left, and it is going to be quite bittersweet. I feel like I’ve killed this phrase, but time is flying. I’ve spent the last two weeks just enjoying Saigon and going to class and getting into my everyday routine which I have been craving. It’s no secret to people that I had a bit of a rough time adjusting to life abroad which (surprise surprise) is 100% okay. Everyone is secretly having their own struggles, and I’ve been trying my best to be transparent now a days. I feel a lot more okay with saying “I think I’m going to take a nap, but thanks!” to people. My service learning placement has been amazing. For the program here, you do have to have to complete some hours at a service learning site (or take the internship class) but, honestly it’s something I’ve been craving since I came here. I officially started right after the Tet holiday in late February, and wow it has already improved my time here a million times over. Having something I go to weekly now keeps me sane. I get to get out of the dorm so I don’t keep taking boredom naps, but I also know I’m spending my time here productively within the community. A few of us go to the Green Bamboo Shelter that house boys in Saigon and we teach English. Obviously none of us are qualified teachers, but we are native English speakers which is super helpful for people learning English especially with pronunciation. We have been working on a curriculum to help us guide out study session a little better and to have for Loyola students who follow after our semester, but these sessions are exactly what I needed. We get to talk to these boys who are the cutest, cheekiest, and hilarious kids ever. Its fun to just spend time with them, but also we know we are helping in the ways we can with their English skills. The weekends we have thrown in with a pool day and board games also helps us sneak a few days in just to hang out with the Green Bamboo boys. Our Bach Khoa partners took us out for dinner the other night and we had quite the meal. First, we had the fluffiest yet crispiest bread I’ve had in Saigon. I know I know Emily shut up about the bread BUT Saigon has the best baguettes (from the long history of awful French occupation). For our actual food we had quail. Yes, the cute lil bird. And it was delicious. 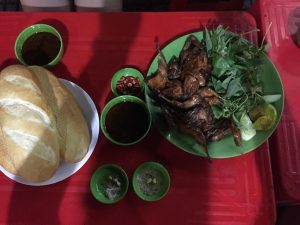 In Vietnam they do eat almost everything so after a long deep breath, I ate a quail head. It was an experience. I thought that qualified me as ~fully immersed~ but, no I had another snack to complete my immersive experience in Vietnam. Does everyone know what balut is? If not open a new tab and google it and prepare yourself. 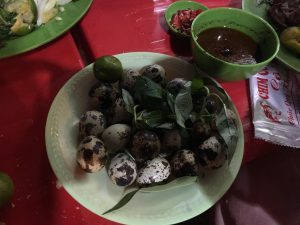 So I ate what is the equivalent of quail balut. It took a lot of baguette to wash it down with but, honestly it wasn’t half bad. You’d expect something like that to be disgusting but it was pretty okay with salt and kumquat juice. The only thing I have left to eat is fresh durian to consider myself pretty well versed in the food. I’ve tasted it in a few snacks that have been in grocery stores with less than satisfactory responses, so maybe the fresh fruit will bring me around to it. Well, next week we head off on our final excursion to northern and central Vietnam. It’s wild how that excursion seemed so far away but, its creeping up on us like our final papers are. I’ve gotten pretty skilled at sleeping on buses and on planes so I say bring it on! I’ll end this entry with the classic food pictures and some food for thought. I think I’ve changed a lot by travelling to Southeast Asia and specifically Vietnam but, for the positive. I’m excited to see my loved ones, but this city has become a lot more than a temporary home for me. So I’m just going to keep making memories and living it to the most of the month and a half I have left. Hi again! 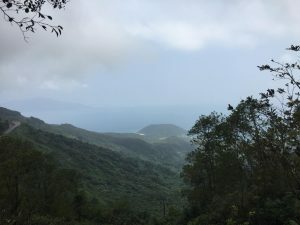 Blogging my life abroad has started to feel almost normal? 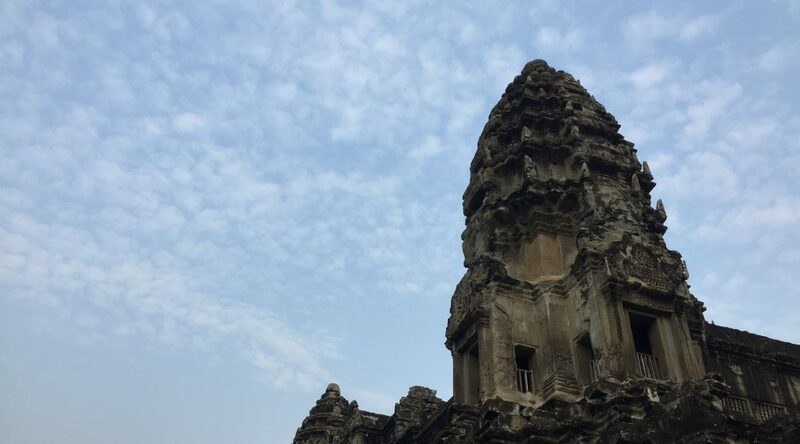 I have had a lot of time to reflect on some important topics during our excursion to Cambodia, so to make this easy on all of us I am going to make a list of the things I’ve learned as a whole while studying abroad. Hopefully I can help inform anyone thinking of studying abroad, and specifically anyone wanting to come to the Vietnam Center! 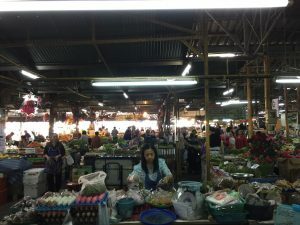 After our trip to Thailand, where the baht is used, and our excursion to Cambodia, where the US dollar as well as the riel is used, you learn to become a money saving master. The exchange rate for each currency is different, but budgeting has become second nature, so I don’t have to keep going to ATMs and racking up those international fees. 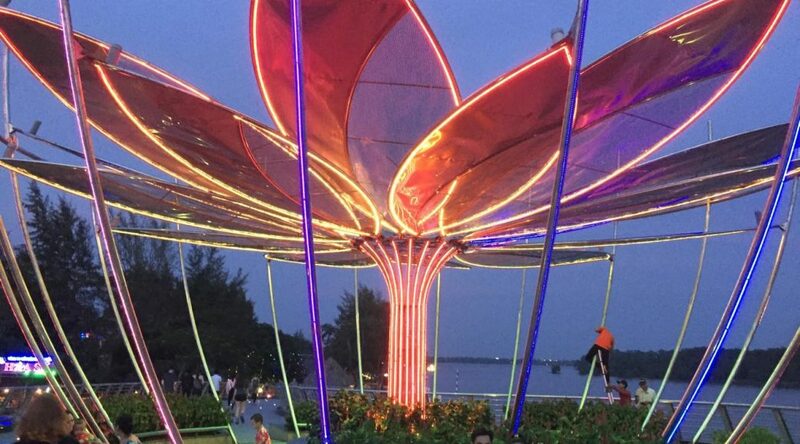 The amazing thing about being in Southeast Asia is that places you only could’ve dreamed of visiting are just an hour flight away instead of a 20-hour flight. I do keep a small amount from each different currency I have just as little keepsakes which I find something I am going to love to have to look back on. Our recent excursion to Cambodia really made this point very clear to me. The Cambodian genocide is something not mentioned in most general education classes, but is a very important historical tragedy that I recommend everyone read into. 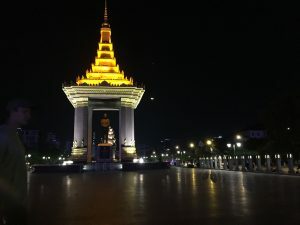 We spent our trip visiting Phnom Penh and Siem Reap where we visited the historically important spots in each city which I am super grateful for. The two sites we visited in Phnom Penh were the Tuol Sleng Genocide Museum and the Choeung Ek Killing Field Genocidal Center which become not only a sobering moment, but a reflective one. 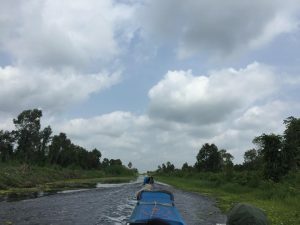 Speaking to the tour guides and people we met allowed us to learn more information about Cambodia in a handful of days than I knew in my entire life. When Loyola said this experience would be immersive, they weren’t kidding (in the best of ways). My time here has showed me that I actually am learning and not just running around Saigon as a 19-year-old American with no direction. I am finding ways to incorporate what I’ve learned slowly into my life. I have also learned so much from our BK partner students and would listen to them speak non-stop about their lives if they wanted me to. It’s amazing to pick up on things you never really knew about Vietnam even after being half way through the semester. I just found out I’ve been telling my taxi drivers the wrong way to turn since I got the two Vietnamese words mixed up for right and left (I should’ve enrolled in that Vietnamese class huh?). As mentioned, we also went to Siem Reap while in Cambodia and went to the Angkor Archeological Park. We woke up at 4am (yes you read it correctly!) 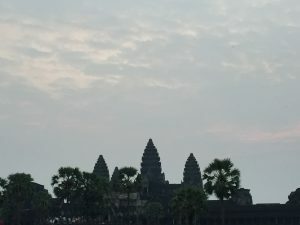 to see the sunrise over Angkor Wat, the largest religious monument in the world. 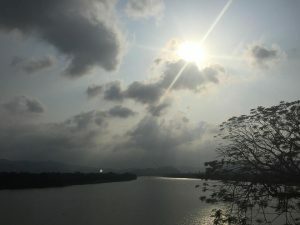 It was a lot of walking and tuk tuking (motorbikes with an attached ack for up to 4 people to sit) and standing in the sun, but it was all worth it. We got to venture around a few of the temples including Angkor Wat, Bayon, and Ta Prohm (The temple in Tomb Raider!). 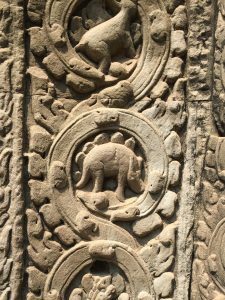 If we didn’t get our lazy bones up that bright and early we wouldn’t have spent so much time seeing temples almost a thousand years old and the carving that looks like a dinosaur in Tam Prohm. I don’t think I am going to stop learning as long as I’m here, and as the days roll by I do get nervous to come home. I think I am going to miss living and studying in Vietnam a lot (and the 22-hour flight back has already given me nightmares aha). I definitely know I am going to fall victim to reverse culture shock, but I do know I am going to get myself back to Vietnam one day again. These past two weeks have been busy, busy, and more busy. Now that I have hit the one month marker, I feel I have finally relaxed into my life as a study abroad student living in Vietnam. After a few nights of disbelief, stress, and even some discomfort, I think the adjustment has (almost) been made. Classes have been wonderful! Majority of the classes are directly taught through a lens of Vietnam and/or Southeast Asia and offer a viewpoint I haven’t had the privilege to be exposed to until now. Specifically, my Literature course and Religion course are rooted directly in material of Vietnam and Southeast Asia and the readings for both classes are some I don’t think I would just stumble across myself on my own. 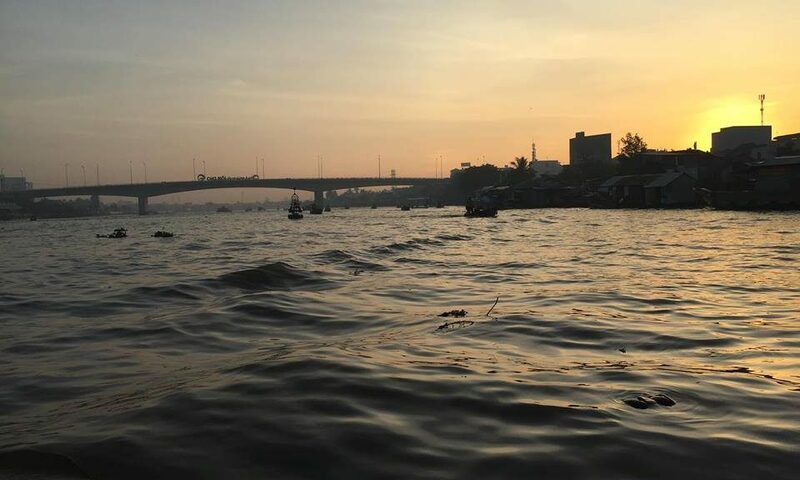 Being able to immerse myself in the culture of Vietnam and learn about the nation from professors that are either Vietnamese or have studied and lived here for years is one of the reasons I chose this center for my study abroad semester. I am happy to report that the classes have lived up and went beyond what I thought they would be. Soooo I know I just gushed about Vietnam like I usually do (I bet my friends and family are tired of hearing me do the same everyday), but I actually travelled this past week outside of Vietnam! This week marks the start of Tết, which is one of (if not the most) important holiday in Vietnam. It is the national celebration of the Lunar New Year and takes place over this entire week, with the core celebrations being the 16th through the 18th. We have no classes during this holiday and have had significant time off which we can use to travel. Myself and a few of my friends in the program decided this would be a great time to take a trip to Chiang Mai, Thailand! Lemme tell you, Chiang Mai is pretty different compared to the bustling nature of Saigon. Our hotel was on the edge of Old Town (the square center town part of Chiang Mai) and was in a relatively quiet area, a stark contrast to district ten of Saigon. Our first day we landed and immediately went straight for Pad Thai. I thought Pad Thai in the states was good but, y’all I was so wrong. 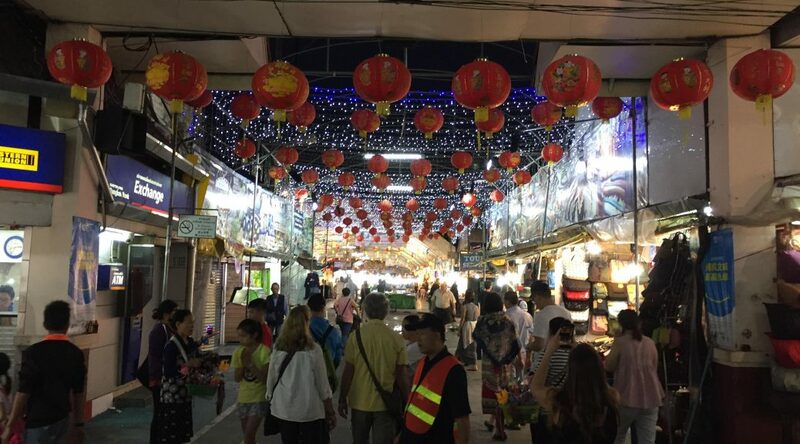 We walked around some markets and the night bazaar as well as the various Buddhist temples within the city. The sheer amount of beautiful structure and architecture we got to see was amazing. 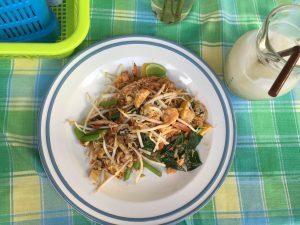 One of my favorite experiences was the Thai cooking class we went to. We were picked up from our hotel bright and early to visit a food market and learn about some of the ingredients we were going to cook with. 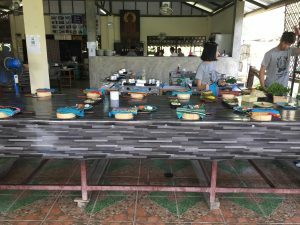 We were then taken to the cooking class were we physically chopped all our ingredients, made our own curry paste, and cooked everything ourselves with help from our instructor Peanut (I know amazing, right?). 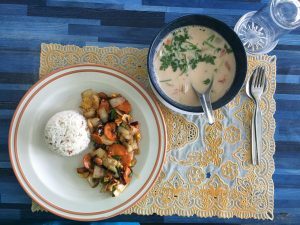 We made three meals: A stir-fry, a soup, and a curry as well as Thai iced tea. We had a few options for each and I decided to go with cashew chicken stir-fry, coconut chicken soup, and a Kao Soi/Chiang Mai curry. Of course, everything was delicious and I think I may have to try out for Masterchef next season (hopefully they only want Thai food). We got a cute little cook book of all the recipes which I am super grateful so that I don’t royally destroy my kitchen and local supermarket looking for the ingredients I don’t remember the name of and making the dishes. The next day we went to and elephant sanctuary because if you don’t go to one, were you really in Thailand (I kid, I promise). 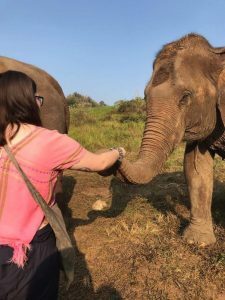 Of course we made sure we went to one that was definitely cruelty free and didn’t allow any riding and we were happy to find a bunch of places that did have rave reviews that ensured the treatment of the elephants is just. Once we arrived, we changed into some clothing over our own and started to chop up some sugar cane to feed the elephants. 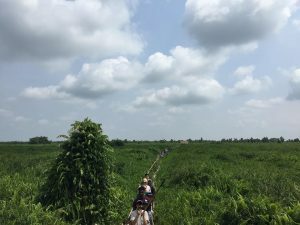 The guide ensured that their goal of the sanctuary was to keep the elephants healthy and happy (and that sugar cane is some of their favorite snacks). The elephants we got to see were elephants rescued from a riding company, had worked for farms when they were younger, and/or had been in the circus. The three large elephants had been rescued and included an older one deemed the “grandma” and two middle aged elephants. The last one was a 2-year-old baby that had been born at the sanctuary. We got to feed them the sugar cane we chopped, which was an experience and a half. They were all so gentle and sweet and hungry. The guide told us each elephant has a personality and that the younger one likes to be “naughty” which was definitely proved when he kept dropping every piece of sugar cane we gave him. After a brief walk, we got to go into a river/stream and bathe the elephants, which again was quite the adventure in itself. Afterwards we said our goodbyes and headed back to our hotel. Upon returning to Saigon, we have Tết getting closer and closer. A majority of the students here are going home with their Vietnamese partner students from Bach Khoa University to visit their hometowns. 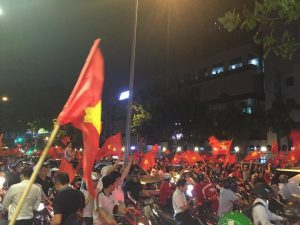 Saigon is supposed to get immensely quiet during Tết as majority of the people are not from the city and leave to go to their home providences to celebrate the holiday among family. I have a lot of work to catch up on for classes (classic Emily) as well as I don’t want to get burnt out because we have another excursion coming up at the end of February to Cambodia and decided to stay in the dorm during the holiday. 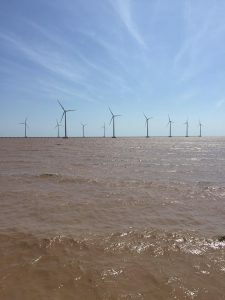 My partners do have other students coming to visit their home town and I am very very very excited to hear about the experiences and see pictures! As the half way point draws close for this semester, I am sad to know it is going by so quickly. I had Déjà vu stepping out of the Saigon airport coming back from Thailand and it felt like I had just landed in Vietnam for the first time. I’ll close out as the reoccurring theme of the random food pics I take throughout my time here! Hello all! These past few days in Vietnam have been absolute chaos, but in the best way possible. 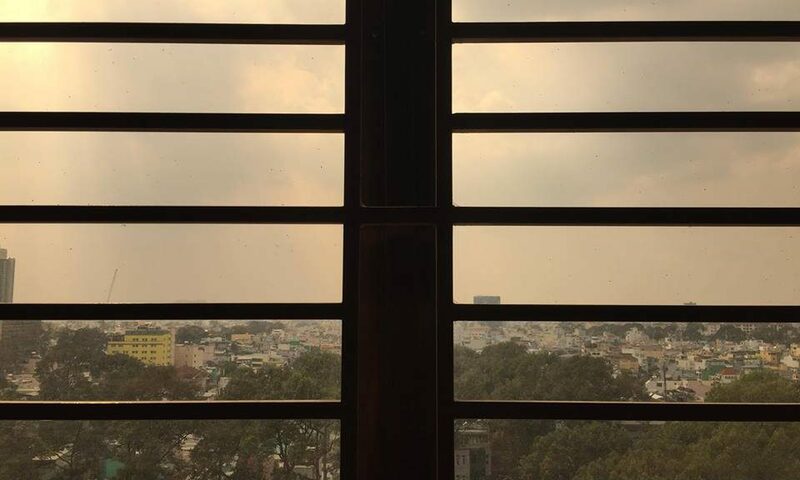 Classes have just started, but I have already learned a lot just by living in Vietnam for around a week now (I don’t even exactly know how many days I’ve been here due to the time change, but we will get into that in a little bit). 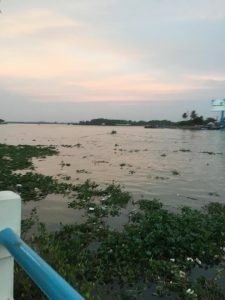 For this first post, I think I’m just going to talk about some of the experiences I’ve had on my way over and the first few days, so if you want to follow me along my 8,697-mile journey to Vietnam just keep reading. In classic Emily style I didn’t start packing for my four-month journey until the week before I left. I tried to pack light knowing that Ho Chi Minh City can average around 30 degrees Celsius, so you know, only 86 degrees Fahrenheit. That is quite the change from the frigid and now snowy weather in Chicago. I don’t think I’m adjusted to the heat yet, but the key is to drink a lot of water and have Gatorade packets to keep electrolytes up. We are very lucky to have air conditioning and we sure do use it. Saying goodbye was a lot harder than I had thought and one highlight from the airport included my goodbyes. 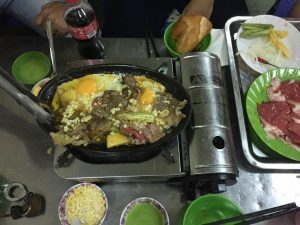 Before I left the US, I wanted to make sure I had Vietnamese dong with me when I landed so I don’t rack up too many international ATM fees. I didn’t realize I needed to go through security to get to the correct currency exchange location and I only knew this as I was almost to the front of the line. Almost like a movie, the camera pans and you see me dash out of line to find my mom and boyfriend to say goodbye before I go through security and not have to go through everything again and end up being late and miss my flight. After a good tearful goodbye, I was off on my way! Let’s get things straight: a 22-hour flight is not fun. I know, shocking? I flew to Shanghai and had a layover which was interesting to say the least. You meet so many people while in long lines to go through security again which I do think was my highlight of my flights. 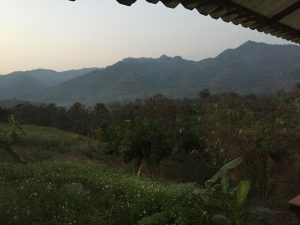 One girl was just backpacking and didn’t really have a plan for when she lands in Vietnam and my mind still wanders to what she is doing right now. The second flight was not as rough as the first as it was a lot shorter and I slept through it like a baby. Once I landed at the wonderful time of 2:00am Vietnamese time, program members picked me and a few other Loyola students I had met up with to bring us to the dorm we are staying at. Prepare yourself because I’m about to rant about Vietnamese food and drinks now so hold tight. 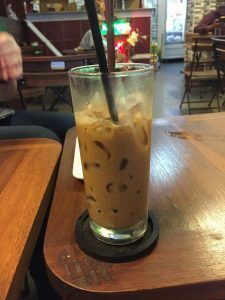 Vietnamese iced coffee (cà phê sữa đá) is a staple here and a great way to socialize as there are so many coffee shops around Saigon (another name for Ho Chi Minh City by the way). It’s iced coffee with condensed milk and tastes nothing like the bitter coffee experiences I’ve had at home. Street food is also a vital part to my experience. Street vendors are almost everywhere selling various kinds of food, which by the way are all delicious. 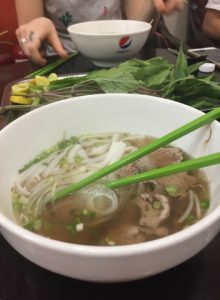 I’ve eaten so much phở this past week its ridiculous, but I’m not even mad because its so good. 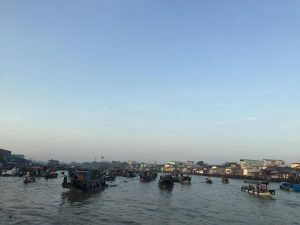 I came to Vietnam without many expectations as I have never visited Southeast Asia before, but I have been surprised many times over. Motorbikes are a huge part of the city here. They are certainly the majority in the streets over cars and do there own thing all the time. They are a very convenient way to get around, but man do they like to not follow any rules. Driving on the sidewalks are not out of question as well as ignoring traffic patterns. They do seem very scary, but slowly I’ve gotten used to them. Walking through the streets with “predictability and a slow pace” is how to attack getting one place to another. The bikes will go around you and it is very safe and kind of fun after a bit of an adjustment. The public buses are also something very soon. They slow to almost a stop when they pick you up, but you have to be prepared to flag them down to pick you up as well as hop onto a slow rolling bus. 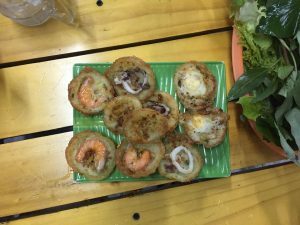 As I close out this entry, I do want to say a few things to anyone thinking about coming to Vietnam to study abroad: do it. It’s like living in a dream. 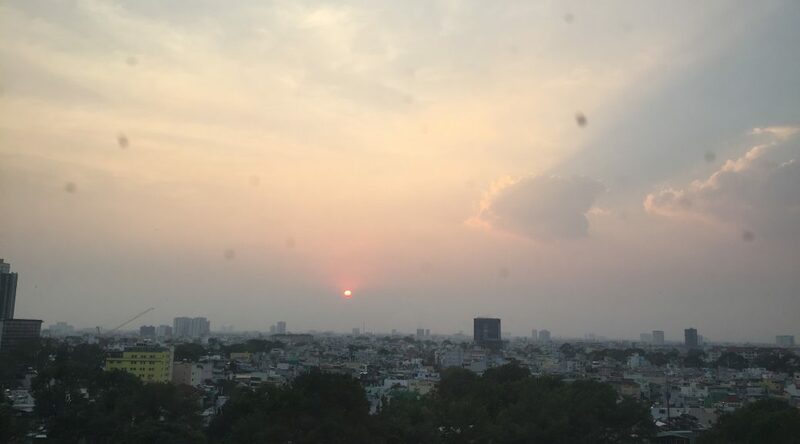 There are some difficulties I’ve encountered like the 13-hour time difference from Chicago (saying good morning to everyone as they say good night to me is still pretty odd) and not knowing Vietnamese at all, but I do not regret my decision at all. Every Vietnamese student I’ve met has been so open and warm to us, the classes I’ve been to so far have already opened my mind, and the faculty has been wonderfully helpful. I’ve been asked “Why Vietnam?” so many times and the best way I’ve responded is “Why not?”. Yes, this is all very new and can be odd, but to learn you have to be uncomfortable in some sense. If I don’t stop myself now, I’ll keep talking forever but, I can’t wait to keep everyone updated on my semester at the Vietnam Center!